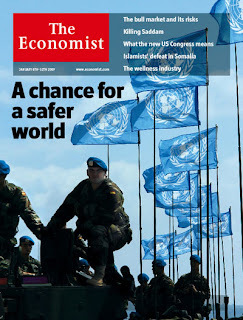 I read The Economist's for a few years now but the new issue of this week with a cover story about the United Nations is one of the most interesting ever. That the magazine's editors chose not to tag a question mark at the end of the cover headline, "A Chance for a Safer World," tells you precisely where the package is going. Two of the special report's articles can be accessed for free, but the rest of the content is behind a subscription wall. "And although the [US] is often the UN's harshest critic, it has come again to see the point of turning to the UN for help with problems - be they keeping the peace in Lebanon or saving lives in Darfur - it finds hard to solve alone." ... "[T]he permanent five could make the world safer and more orderly by showing a greater willingness to work together using the existing structure...All the big powers ought to see the benefit of making better use of the potential for joint, lawful international action that the UN uniquely provides." Article partly taken from Mark Leon Goldberg from UN Dispatch.